Pakistan Prime Minister Yusuf Raza Gilani has termed his talks with his Indian counterpart Manmohan Singh as "positive" and said they discussed all the core issues between the two countries. "Talks were positive. We discussed all the core issues between the two countries," Gilani told the Pakistan media in a brief chat after his dinner meeting with Dr Singh in the midst of the World Cup cricket semifinal with India in Mohali. "Today's match brought the peoples and leadership of the two countries together. This, I believe, is the positive outcome of today's semifinal," he said in a message. Gilani said, "winning or losing a game does not matter more than its quality and the team spirit" and congratulated both the teams "for demonstrating sportsmanship and quality game". He hoped there would be other occasions when both teams would play with each other both in India and Pakistan. Gilani told PTV that "winning and losing is something that has its own place but this is a victory for cricket and the two countries". "On the basis of this, we came together today and we held discussions on the sidelines (of the game) and we talked on all issues. It is our determination that we will resolve all issues", he said. 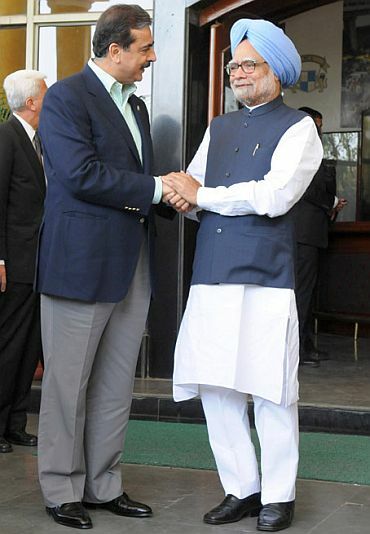 Gilani said, "I congratulate the (Indian) Prime Minister for the resumption of the composite dialogue. It was his promise in Thimphu and it was in the spirit of Thimphu that Tuesday's meeting of the Interior Secretaries was very successful. A good message has gone through." "We don't want that we are unable to resolve our own issues. We have the capacity and ability to resolve our issues by ourselves. We held talks on all outstanding issues and Prime Minister (Manmohan Singh) showed magnanimity by saying he is ready to resolve all issues by sitting together," the Pakistan prime minister said. He said, "We want positive messages to be sent by both countries and our common enemy is poverty, hunger, disease, unemployment. We should give attention to that and Prime Minister (Singh) has said earlier and is saying today that the intention of both of us is to resolve these issues and both the countries should prosper. There should be prosperity and development." 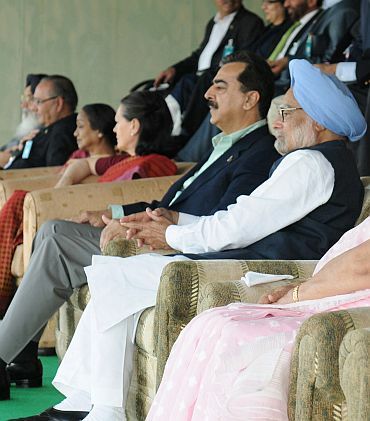 Gilani conveyed to the people of India that Pakistan wanted good neighbourly relations and "the resolution of all issues through dialogue will bring peace and prosperity to our people".